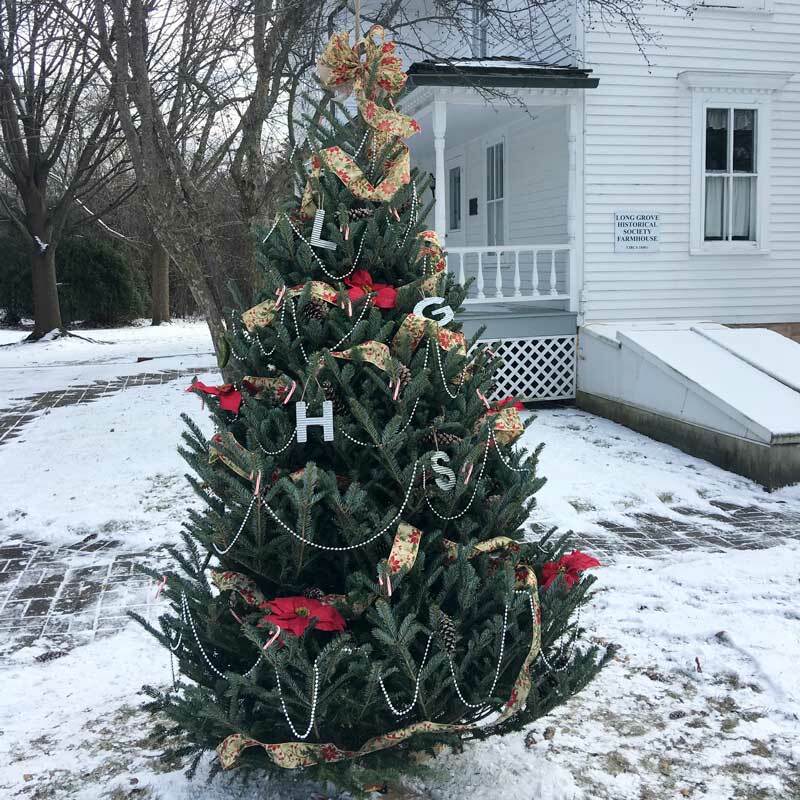 The elves at the Long Grove Historical Society decorated this downtown holiday tree outside the farmhouse. If you are a regular reader of this blog, you already know a number of things that I love about Long Grove. Add to that list, the positive odds of experiencing a white Christmas. When I peered out the window this morning, my heart skipped a beat. To those of us enjoying the holiday in Long Grove this year, we are in luck! With a snowfall, our open spaces and wooded preserves such as Reed-Turner suddenly transform into a winter wonderland. The beautiful holiday lights and decorations at the historical crossroads look so much more magical with a dusting of snow, as do the 80 outdoor fresh Christmas trees decorated in festive splendor by our merchants and business owners. I missed the tractor rides yesterday due to a family gathering, but I’ve spent the past week finishing up the gift list by shopping in some of my favorite stores. One Long Grove shop owner mentioned that sales are up 10 percent for the year and 25 percent for the holiday season. Two more indicated that things are going so well this year, they are close to running out of Christmas themed merchandise. Not to worry…orders have already been placed for additional new and exciting inventory in the year ahead! Being warmly greeted by smiling faces in our downtown shops and restaurants has truly helped make my holiday season extra merry and bright. There is just something so special about a small-town at Christmastime. And even though the fluffy white flakes that lift my spirits can dampen the joy for those who have to travel, for all of us celebrating the holiday in Long Grove…let it snow, let it snow, let it snow! 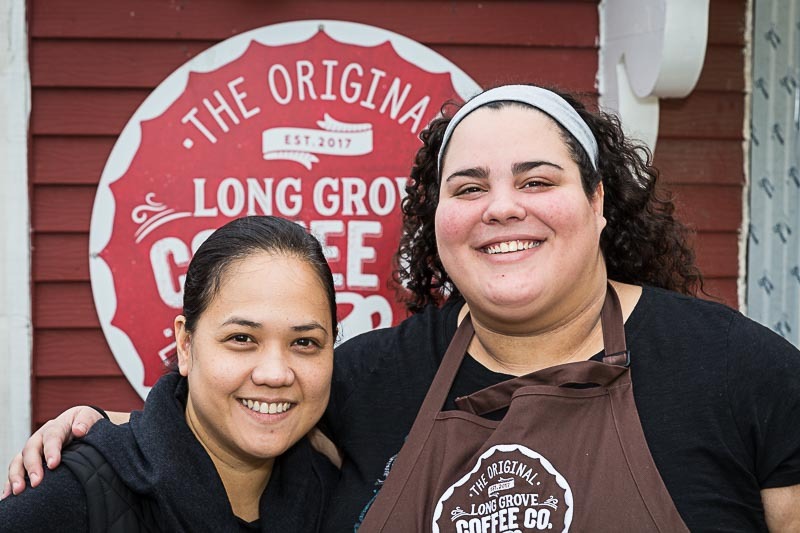 Two of the friendly faces that will greet you at the new Long Grove Coffee Company are (L to R) Ethel Berger and Ellee Leva. Ever since my favorite Long Grove coffee shop, the former Beans & Leaves closed this summer, our weekly women’s huddle has been forced to meet elsewhere for caffeine fortification while we solve all of the world’s problems. Well, life in Long Grove just got a whole lot better for those of us who have been missing our favorite gathering spot with the recent opening of the Long Grove Coffee Company. Located at 126 Old McHenry Road, the new business is part of the renovations being undertaken by the Long Grove Confectionery with their expanded properties near Towner Green. The Confectionery has officially reopened as of last Friday, and is chock full of treats for those Christmas stockings as well as sweet gifts for the holidays. Right now, the buildings look a bit naked as the old siding was removed this week in anticipation of a new upgraded exterior coming very soon. As I was getting my latte today, I asked barista Ellee Leva what happened to their “skin,” and she told me her Dad (Confectionery owner Craig Leva) wanted the outside to look just as beautiful as the newly renovated interiors of the buildings. The coffee shop features large tables for groups (one of which is a cool vintage treasure from local shop Scout and Forge), smaller tables for meet-ups, and a comfy couch and chairs for casual conversation. I happened to be there when the new couch was delivered so I can vouch for the coziness! Long Grove resident Ethel Berger, who ran Beans & Leaves, has returned to head up the operations at Long Grove Coffee Company and her regulars have already started to settle in to the new location. Plans are underway to add some additional food offerings in the months ahead and to continue the tradition of live music that the community enjoyed at the former location. 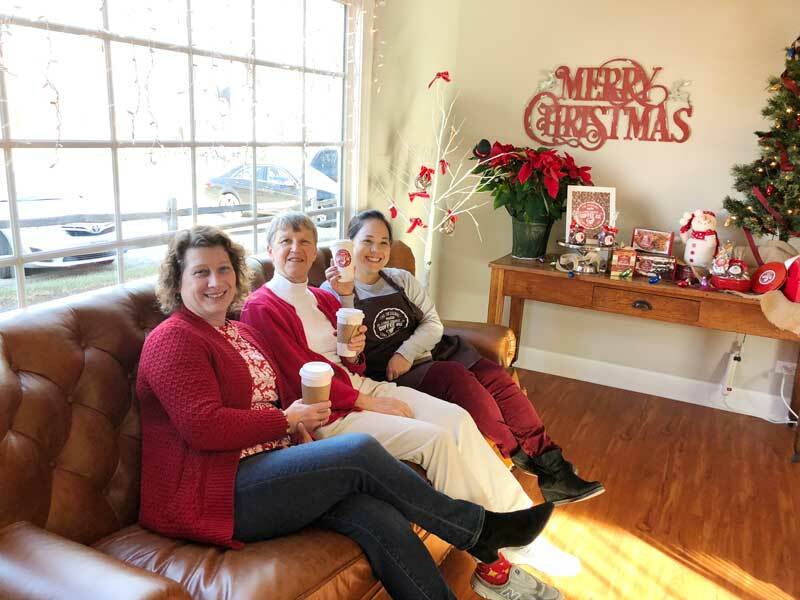 As you finish your holiday shopping in our historic downtown, stop by for a warm beverage and piece of chocolate and get acquainted with one of the many new businesses that have opened this year in Long Grove. The new couch awaits you!! Testing out the brand new couch on December 8th (L to R): Angie Underwood, Marie Roth, and Ethel Berger. 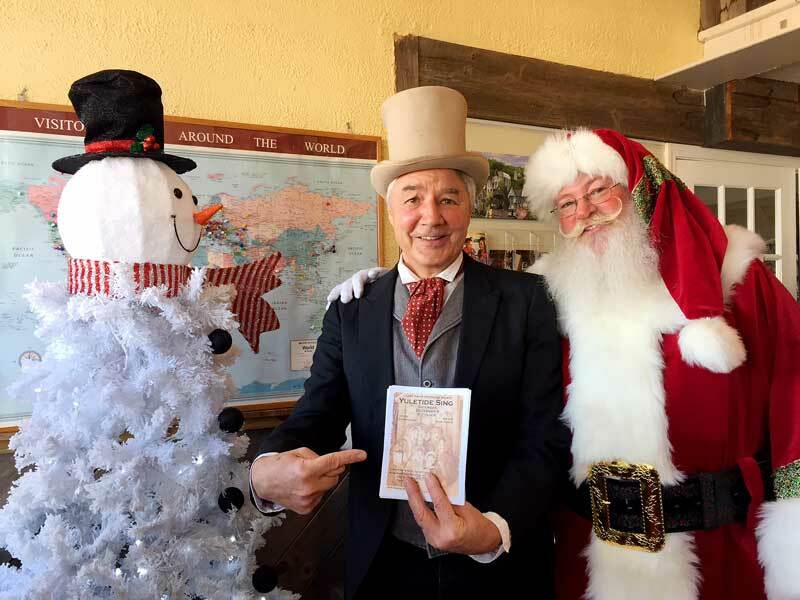 Historical Society Yuletide Sing Songmaster Mike Dvorak was seen recently attempting to recruit Santa to the event. One of my favorite holiday memories as a kid was going Christmas caroling door to door in my hometown. The Long Grove Historical Society is looking to revive this tradition with our Yuletide Sing event, being held this Saturday, December 9th. Instead of walking throughout town (which is challenging with most of us living on 2-3 acre lots!) we will congregate on the back porch patio of our historical 1860’s farmhouse and join together in songs of the season from 6:00 to 7:00 pm. We will be accompanied by a special Yuletide Band featuring guitar, keyboard and hand percussion performed by Zack and Josh Langhoff and Mike Dvorak. The sing-a-long set list will include such holiday favorites as: Deck the Hall, Frosty the Snowman, Jingle Bells, Rudolph the Red-Nosed Reindeer, and Dreidel, Dreidel, Dreidel. Don’t worry about remembering all the lyrics because song sheets will be available. Everyone in the community is invited to this festive, free, family gathering, no RSVP necessary! Girl Scout Troop #40436 will be on hand to help lead the carols and provide some holiday warmth in the form of hot chocolate. There will also be a bonfire to help keep the chill off toes and fingers. Be sure to dress for the winter weather as this event is outdoors. Come gather this weekend and enjoy an old-fashioned hometown sing with your friends and neighbors, and celebrate the simple pleasures of the season. The beautiful holiday lights in our historic downtown are guaranteed to put a smile on your face!